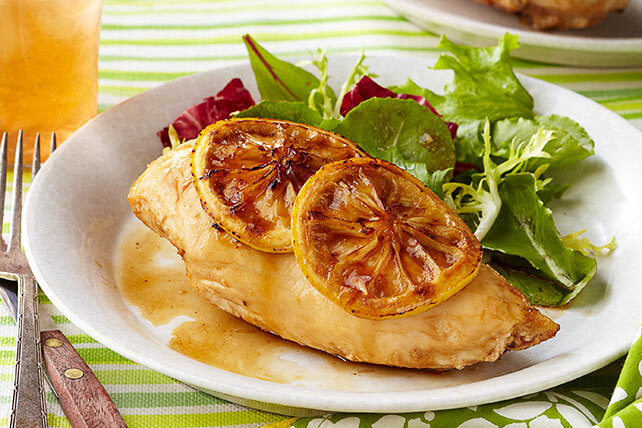 Go for a classic with Lemon-Garlic Chicken! The combo of lemon and garlic proves it's a winner in this simple but elegant baked Lemon-Garlic Chicken dish. Spread lemon slices onto bottom of 13x9-inch baking dish; top with chicken. Mix dressing and garlic until blended; pour half over chicken. Refrigerate remaining dressing mixture. Bake 40 to 45 min. or until chicken is done (165ºF). Toss lettuce with remaining dressing mixture. Serve with chicken. Discard lemon slices or use as a garnish. Always use a thermometer to see if chicken is cooked through. The internal temperature should register at least 165ºF. When the chicken is completely cooked, the juices should run clear.